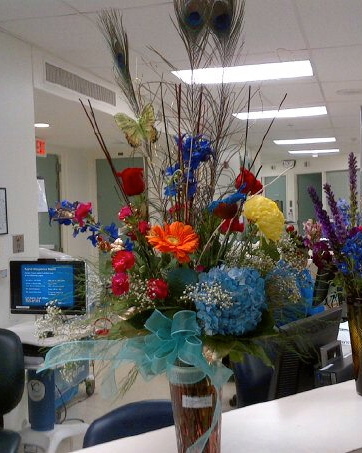 I sent flowers to poor Gary in the hospital Saturday and then saw a picture on his Facebook page of what I thought was our bouquet. Whaaaat? I thought. I’d asked the finest florist in Cambridge to collaborate with the finest florist in Memphis and this was the result? I mean, a turquoise bow and … peacock feathers for trying to recover from the shock of being hit by a van while out on a morning run? 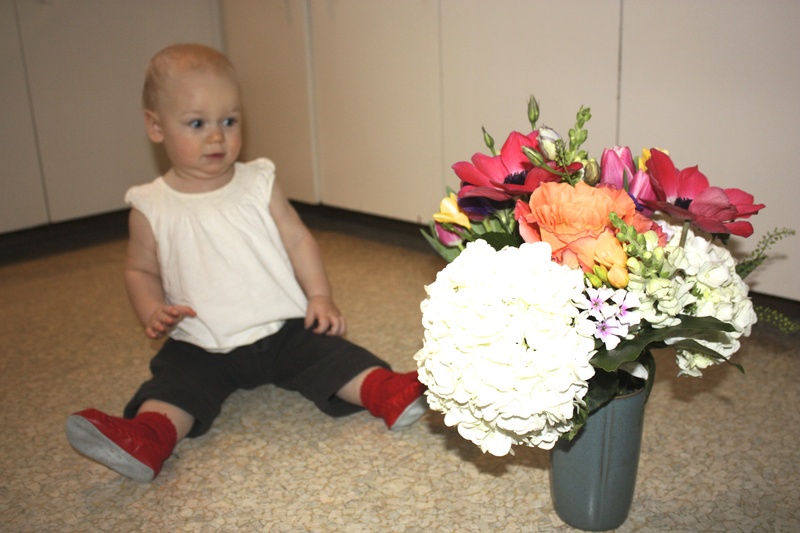 I was as surprised to see the look of these posies as our little granddaughter was last month when her momma set her down next to her own birthday bouquet. She got used to them of course and two seconds later was likely trying to put them in her mouth.. But the unexpected does rock you momentarily. I know I was rocked by the sight of that flower arrangement straight out of Dr. Seuss – until somebody clued me in to the fact that MY flowers were as straight-lacedly demure as something you’d expect to come from the town where Longfellow and Lowell and Oliver Wendell Holmes all lived, whereas this yard-tall arrangement was in truth from his work cohort who purposely ordered something over the top to bring to him one what must be one the only smiles he has had there at the Trauma Center.